If you happen to be driving through Arizona, one of your top stops should be the ghost town of Oatman along the historic Route 66. Not only does it give you a Wild West feel, but you’ll be surprised to be greeted by donkeys. The town was named in the honor of Olive Oatman, a young girl who was kidnapped by an Indian tribe and later rescued. Oatman was once a lively town during the gold rush, but when the mines dried up the town was eventually abandoned. The town is also famous for its burros—an old Spanish term for donkeys—rambling on the streets. These wild burros are the offspring of the burros that were transported there during the late 1800s. They were used by the miners to carry loads and essential supplies in those days. When the miners no longer needed them, they were let loose. Today, Oatman is home to just over a hundred people and these burros, according to Back Road Ramblers. With a handful of souvenir shops and restaurants, the town mainly survives on its revenue from tourists. Built in 1902, The Oatman Hotel is probably the most famous landmark of this town. Hollywood actors Clark Gable and Carol Lombard honeymooned at the hotel. The honeymoon suite at the two-story hotel still remains a hot favorite among tourists. However, the key attraction of this town still remains wild burros beyond doubt. Maintained and protected by the United States Department of the Interior, they roam freely about the town looking for food. They are more than happy to greet tourists and expect every person there to feed them. Most of the shops there have food available for the burros, and families with kids are sure to have a gala time feeding these cute critters. The gray burros are friendly and tame, although there are signs warning travelers not to harass them or try to ride on them. They pop their heads into car windows and even walk into shops as they try to get what they’re looking for. And you’d better watch out if you are carrying food on you. The older burros wouldn’t mind chasing you all the way down. After sunset, when the travelers begin to leave and the shops begin to close, the burros also make their way up the hills. Come the next morning, they are back in town as they go about their usual routine. Whether you love them or not, you simply can’t ignore their cute faces as your cars come to a halt. The sight of a baby burro surrounded by cones would probably be one of the most bizarre things to encounter. Visitors are often baffled by this sight, but locals who are well aware of the life of these burros often have some explaining to do. 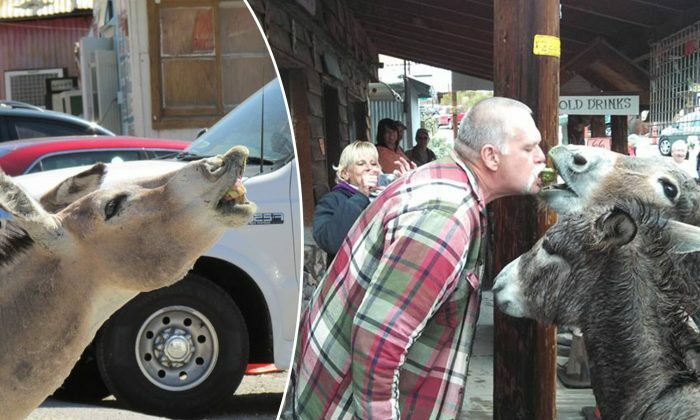 New Digg’ns, a shop in Oatman, shared one such story of a cute burro named Opal on their Facebook page. And, just like that, these burros have now become the center of attraction in this town.